am/fm stereo cassette, anchor, bimini top, bilge pump, carpet, coast guard pack, full gauges, hydraulic steering, knotmeter, storage, ladder, single axle trailer, battery, registered, canvas cover, always winterized & summerized, CANVAS: Bimini Top Boat Cover - 15 ft. thru 19 ft.J ELECTRONICS: Radio/25 Watt VHF - Fixed Mount ENTERTAINMENT: Stereo - AM/FM Cassette w/4 Speakers FISHING: Transom Live Well GALLEY: Fish Box - Insulated 10 cu. ft.
Microwave Oven Range - Electric Refrigerator/Freezer 10 cu. ft.
Water Heater - 6 Gallon MISCELLANEOUS OPTIONAL EQUIPMENT: Batteries - Dual w/Switch External Stearing - Twin Hydraulic Fire Ext. 100 - 200 cu. ft. 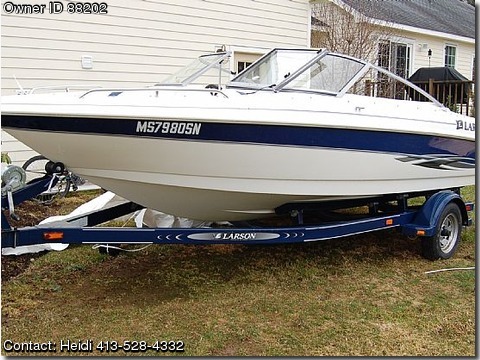 Swim Step w/Fold Down Ladder Transom Bracket Twin Engine w/Swim Platform BOAT OWNERS COMMENTARY: This wonderful boat is a great boat to have a fun day being lazy or a active day skiing and tubing. If you want to be one of those summer gurues who are all about the water and sun then this boat is the boat for you. You can hook the trailer and boat up and go go go. When you put the trailer on the hitch you are all set for some boating. When you are cruising around ANY lake, it is a smooth ride with no jerking motion. It rides on water like a knife cuts through butter. When you are pulling a tuber or a skier, the boat goes forth with no struggle or lag. The bright white interior is very easy to keep clean. There are four cup holders for convience during picnicing. For some ambiance turn on the radio or put a casette tape in and enjoy. The person who gets this boat is in for a real treat, not only becasue it is a AWESOME boat but because this boat has soooo much life left in it. With less then 200 hours it is a real STEAL. Don't pass this up, no other boat that has been owned this long will look this good and have so much left in the motor.